The American National Standards Institute (ANSI), is a private, non-profit membership organization representing over 1,000 public and private organizations, businesses and government agencies. They seek to develop technical, political and policy consensus among various groups. Their web site is http://www.ansi.org/. ANSI does not develop American National Standards (ANS's), but they accredit qualified groups to do so in their area(s) of technical expertise. There are over 14,000 ANSI-approved standards in use today. ANSI-approved standards are voluntary, however some of the content of these standards are incorporated into state and/or federal regulation "by reference" meaning that the regulations refer the reader to the standards without restating them. ANSI is the official U.S. representative to the International Organization for Standardization (ISO). You may have heard of the ISO management system standards ISO 9000 (quality) and ISO 14000 (environmental), especially if you read Dilbert a lot. 29 CFR 1910.1200, the OSHA Hazard Communication Standard took effect in 1986 and it was not until June 1, 2015 under the current regulation that OSHA required a specific format for what were then called Material Safety Data Sheets (MSDSs) and are now called more simply Safety Data Sheets (SDSs). OSHA had a suggested Form 174 (OMB #1218-0072) with eight sections that contained the required HazCom information, but they had no statutory authority to require any standard format or wording. As nothing in the HCS prevented manufacturers from adding additional information to the MSDS, the formats of MSDSs began to vary wildly from manufacturer to manufacturer, particularly for those engaged in international commerce. ANSI-format sheets had all of the information required on the OSHA 174 format sheets as well as additional useful information. The information on an ANSI format sheet was arranged in a consistent format whereas OSHA 174 had no format requirements, only content requirements. ANSI format was more consistent from country to country, permitting one to use the same MSDS in different markets without significant modification. It did not take long for OSHA to realize the benefits of the ANSI format and they began to explicitly recommend it in 1998. It took some time, but the Z400.1 standard eventually worked its way into the Globally Harmonized System of Classification and Labeling of Chemicals (GHS) model system which forms the basis of the current US SDS standard, HCS 2012. The current ANSI SDS standard is ANSI Z400.1/Z129.1-2010, Hazardous Workplace Chemicals - Hazard Evaluation and Safety Data Sheet and Precautionary Labeling Preparation , but with HCS 2012 now in full regulatory effect and the GHS being continuously being refined by the United Nations, it is not clear to us what, if any, purpose Z400.1 currently has as it is not incorporated by reference in HCS 2012, but is rather partially derived/descended from it. "Safety, Health, and Environmental Concepts for the Process Industry", Paperback, 2012. Estimated price $108.03. Info and/or order. "Hazardous Materials Chemistry for Emergency Responders, Third Ed", Hardcover, 2013. Estimated price $132.95. Info and/or order. 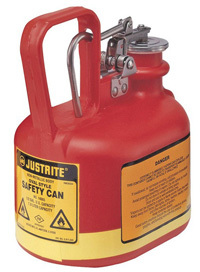 Store and dispense flammable liquids safely with flammable liquid safety cans from Safety Emporium. Additional ANSI standards may quoted on SDS's in reference to emergency equipment such as eye washes and safety showers (ANSI/ISEA Z358.1-2014, "American National Standard for Emergency Eyewash and Shower Equipment") or personal protective equipment such as safety glasses, goggles, and respirators. Introduction to ANSI at ANSI, of course. Overview of the U.S. Standardization System (PDF, 116Kb) from ANSI. The AIHA is just one of many bodies that develops ANSI standards relevant to the OSHA Hazard Communication Standard. ANSI/ISEA Z358.1-2014 Compliance Checklist at Guardian Equipment. What items or formats are required on an SDS? in our SDS FAQ.